As the headline on their websiteÂ states: Â Book Giveaway from America’s Biggest Foodie. To be in the running, like their Facebook page. Â Good luck! We are pleased to announce that David Clark is the winner of the second caption contest! The winning caption for the cartoon shown below is:OMG. This one has been modified to eat itself. 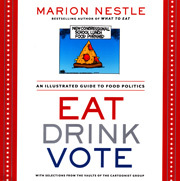 Daivd will receive a copy of Eat Drink Vote signed by Marion Nestle. Congratulations David!See the cartoon as originally published here. A reminder from us: Eat Drink VOTE! Your vote can help to create a food system that is better for us and the planet. And – after the election, please remember that your purchase and consumption decisions will also encourage a food system that is better for us all.